Bob Hope claimed that golf was his profession—show business just paid the greens fees. 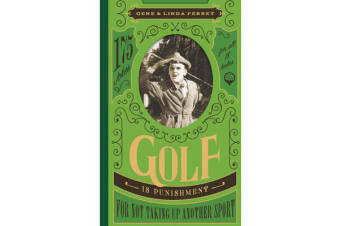 From Hope’s head joke writer, Gene Perret, and daughter Linda Perret comes a joke book for golfers of all skill levels. Golf is a demanding game. It usually demands much more than most weekend hackers have to offer. But the best way to have fun playing golf is to simply have fun playing golf. Sometimes that means laughing at the other players on the green; sometimes that means laughing at yourself. With 175 original gags and one-liners about golf, Golf Is Punishment for Not Taking Up Another Sport is the perfect gift for the golfer in your life.